John Anthony Aniston (born Yiannis Anitios Anastassakis /ˌænəstəˈsækɪs/, Greek: Γιάννης Ανήτιος Αναστασάκης, July 24, 1933) is a Greek-American actor. 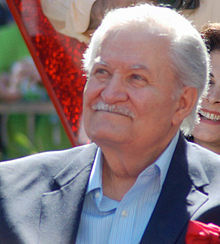 He is best known for his role as Victor Kiriakis on the NBC daytime drama series Days of Our Lives, which he originated in July 1985 and has played continually since then. He is the father of actress Jennifer Aniston. Aniston was born Yiannis Anastassakis (Greek: Γιάννης Αναστασάκης) on the island of Crete, Greece, the son of Stella Joanne (October 1, 1899 – November 7, 1992) and Antonios Anastassakis (January 17, 1889 – May 1965), who hailed from the island of Crete. His father anglicized his name when he immigrated to the United States when Aniston was two, and his parents opened a restaurant in Chester, Pennsylvania. He graduated from Pennsylvania State University with a bachelor's degree in Theater Arts. While at Penn State, he became a member of Alpha Chi Rho fraternity. After college, he served in the United States Navy as an intelligence officer on active duty in Panama and later in the reserve, attaining the rank of lieutenant commander. Aniston has a daughter, actress Jennifer Aniston (born February 11, 1969), with his first wife, Nancy Dow, and also has a son, Alexander, with his second wife, Sherry Rooney Aniston (whom he met while co-starring on Love of Life). His daughter Jennifer's godfather was actor Telly Savalas, one of his best friends. He has appeared in soap operas regularly since 1969, when he first joined Days of Our Lives as a character named Eric Richards, which he played until 1970. In 1975, he joined the cast of Love of Life as Eddie Aleata. In November 1978, he left Love of Life and began playing Mary Stuart's new love interest, Martin Tourneur, on Search for Tomorrow in February 1979. He played that role until April 1984. He returned to the cast of Days of Our Lives a second time, this time as Victor Kiriakis, in July 1985, and continues to play the role. He has been nominated for the 2017 Daytime Emmy Award for Outstanding Supporting Actor in a Drama Series for his performance. He also played a small role on the television series Gilmore Girls. Aniston made guest appearances on Airwolf in season two, Combat!, My Big Fat Greek Life, Star Trek: Voyager, Mission: Impossible, American Dreams (with Days co-star Frances Reid), Journeyman, and Mad Men. 1962 87th Precinct Officer #1 Episode: "New Man in the Precinct"
1964 Combat! Greek #2 Episode: "Vendetta"
1967 I Spy Economides Episode: "The Beautiful Children"
The Virginian Frank West Episode: "Ride to Misadventure"
1969 Mission: Impossible First IMF Captain Episode: "Time Bomb"
1970 That Girl Phil Harvey Episode: "Stop the Presses I Want to Get Off"
1979–1984 Search for Tomorrow Martin Tourneur Episode: "#1.8556"
1985 Airwolf Colonel Arturo Alzar Episode: "Short Walk to Freedom"
1997 Diagnosis Murder Carlton Everest Episode: "Must Kill TV"
Fired Up Gordon Episode: "Honey, I Shrunk the Turkey"
1999 L.A. Heat Alex Zota Episode: "Faces of Fear"
Gilmore Girls Douglas Swope Episode: "A Deep-Fried Korean Thanksgiving"
2003 My Big Fat Greek Life Constantine Christakos Episode: "Greek Easter"
2004 American Dreams John Victor Episode: "Old Enough to Fight"
Journeyman Merrit Ambaucher Episode: "Home by Another Way"
Worst Week Jim Episode: "The Wedding"
Cold Case Herbert "Wolf" James Episode: "WASP"
2010 Mad Men Wallace Harriman Episode: "Waldorf Stories"
2011 The Paul Reiser Show Harold Melon Episode: "The Old Guy"
^ a b c "John Aniston biography". BuddyTV. Retrieved September 1, 2015. ^ "John Aniston bio". Soap Opera Digest. Archived from the original on September 5, 2015. Retrieved September 1, 2015. ^ "Profile of John Aniston". About.com. Retrieved September 1, 2015. ^ "2017 Daytime Emmy Nominations: CBS Leads Networks With 70 Noms, 'Young & Restless' Tops With 25". Deadline Hollywood. March 22, 2017. ^ "John Aniston on Mad Men". YouTube. Retrieved September 1, 2015. ^ a b "The Soap Opera Digest Awards: 1986". Soap Opera Digest. soapoperadigest.com. Archived from the original on March 3, 2009. Retrieved March 15, 2013. ^ "The 44th Annual Daytime Emmy Award Nominations" (PDF). New York City: emmyonline.org and National Academy of Television Arts and Sciences. March 22, 2017. Archived from the original (PDF) on March 22, 2017. Retrieved March 22, 2017. This page is based on the Wikipedia article John Aniston; it is used under the Creative Commons Attribution-ShareAlike 3.0 Unported License (CC-BY-SA). You may redistribute it, verbatim or modified, providing that you comply with the terms of the CC-BY-SA.